Description: Computer artwork representing the molecular structure of diamond, a form of the element carbon. 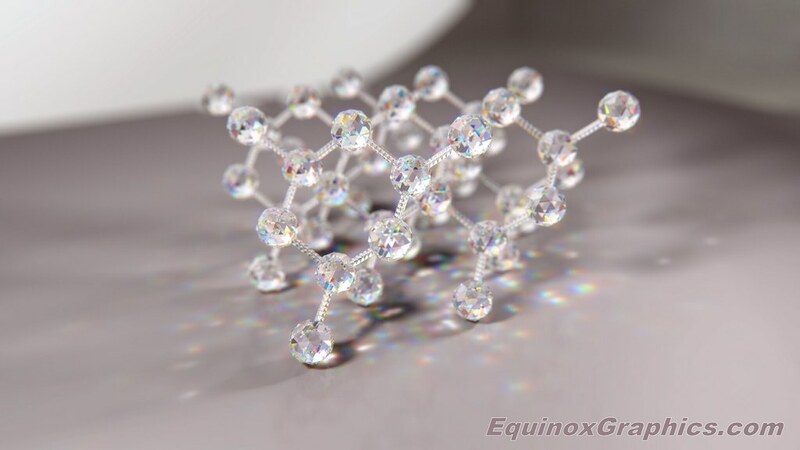 Carbon atoms are shown as gemstones, linked by rigid bonds. Each carbon atom in a diamond molecule is positioned at the centre of a tetrahedron, linked to four other atoms at the corners of the tetrahedron by strong covalent bonds. This repeating tetrahedral arrangement allows no rotation about the bonds, and so the structure is completely rigid, making diamond the hardest known naturally- occurring material. It is used in industry to tip heavy-duty cutting and drilling equipment and is also a precious gemstone.